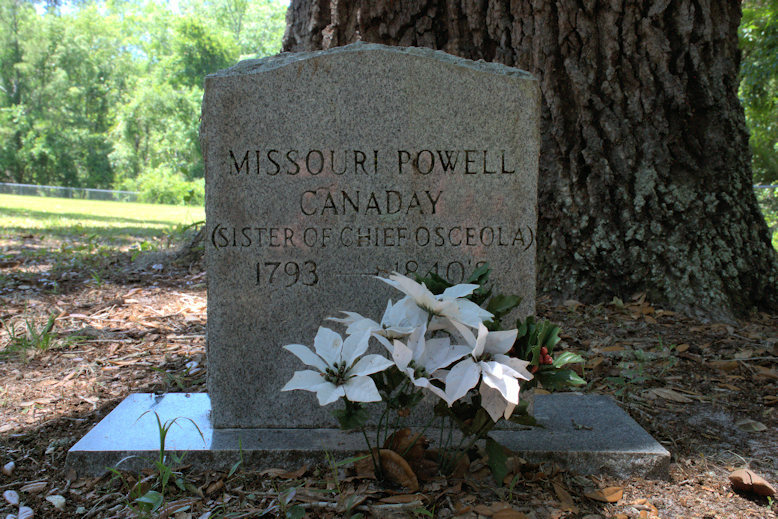 Thanks to Sheilia Willis for sharing the location of Mrs. Canaday’s grave, and for this history, some of which (corrected) comes from a Charlton County history published in 1972: In terms of Chief Osceola [born in present-day Tallassee, Alabama, to Billy Powell to John William and Polly Coppinger Powell. John William Powell was Scottish or Irish and Polly was Creek] , his lineage is most interesting. 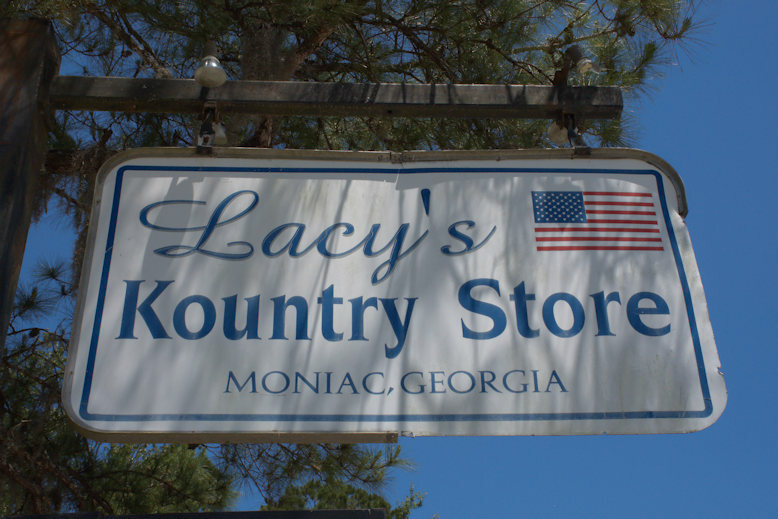 When he was a boy, some of his family and their friends were given sanctuary in the Moniac area after the Battle of Horseshoe Bend when many of the Upper Creeks fled to Florida. His sister was Missouri Powell who married John Milledge Canaday. He was supposedly a Creek warrior who was born in Coleraine, Ireland, and also had the name of Ossio Yahaltla. Perhaps John’s father was there going to school as some Native Americans did during the 1700s. 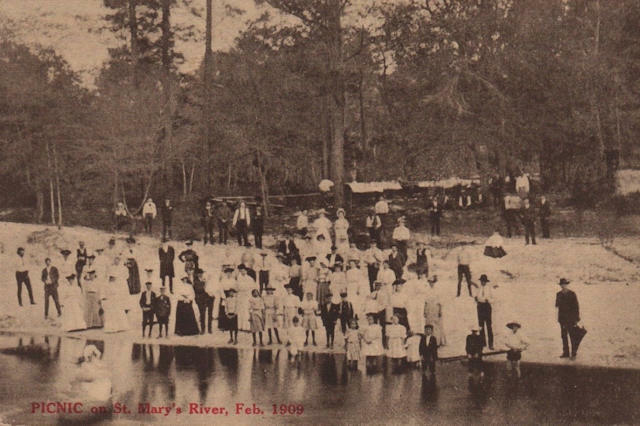 In 1800 John traveled up the St. Marys River and built a cabin near what is now Moniac. 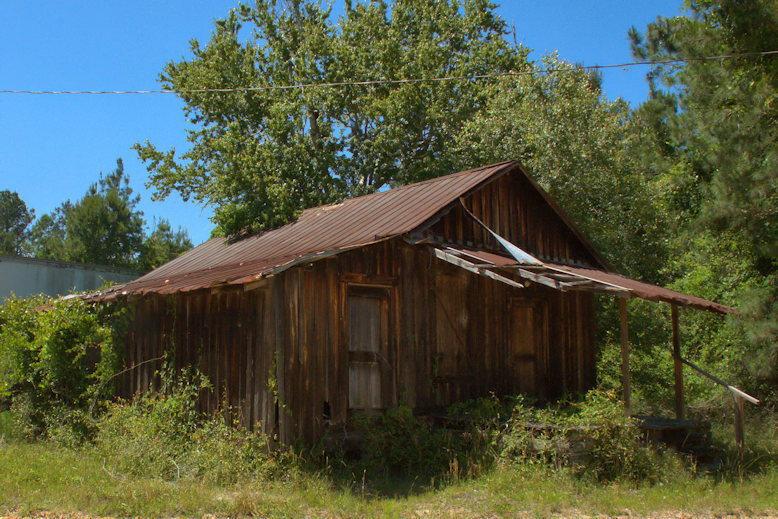 Then he visited relatives in Northern Alabama where he met and married Missouri Powell. Later, he went back up there to fight Andrew Jackson but when the Red Stick Creeks were defeated in 1814, he brought his wife’s family, including Osceola, down to this area. The Canadays remained here and Missouri’s sister’s family later went to adjacent Columbia County, Florida, but the rest of Osceola’s family moved farther down into Florida where he grew up and became famous as a leader of the Seminoles who you know had some of their origins from the Creek/Muscogee Nation. 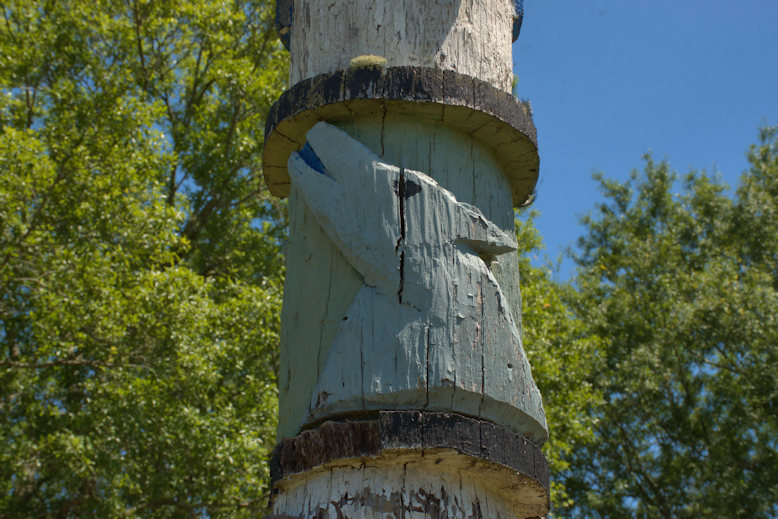 The Canadays had many children and one of their descendants lives in St. George and runs the Canaday Gas Station there. My father and I always do a pit stop there when we go to the VA hospital in Gainesville. 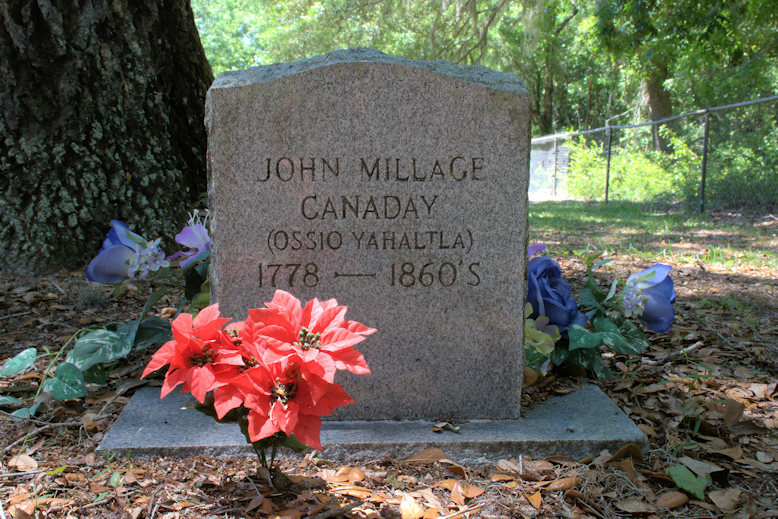 Of Missouri’s children, John Milledge Canaday, Jr and his wife Sarah Howell Canaday are buried in North Prong Cemetery, which is a few more miles south and then on the west side of the St. Marys in Baker County, Florida. Sarah’s family was killed by Indians at Toledo. The death of the Howells is sometimes mixed up with the Canaday children but if you check the births, deaths, and marriages, you will see the difference. 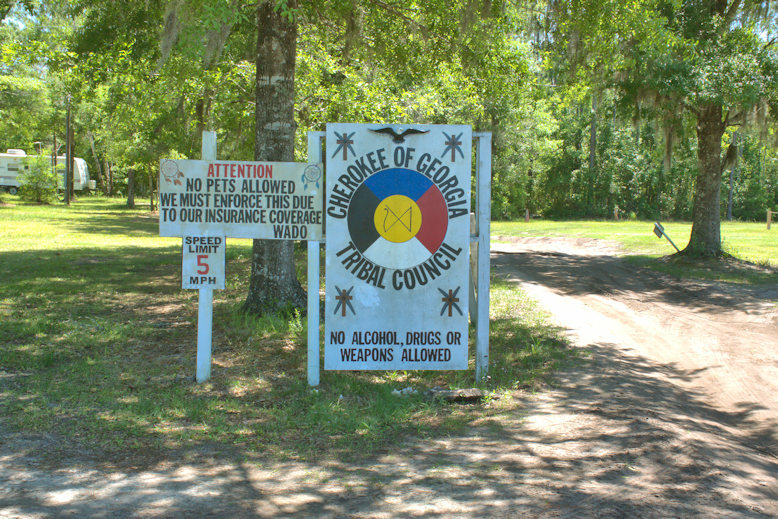 [The other children were Osceola Nikkanochee Canaday b. ? ; Elizabeth Canaday b. 1823; Mary Ann Canaday b. 1824; Henry Canaday b. 1829; James Canaday b. 1831; William Jackson Canaday b. 1833; and Frances Marion Canaday b. 1840. 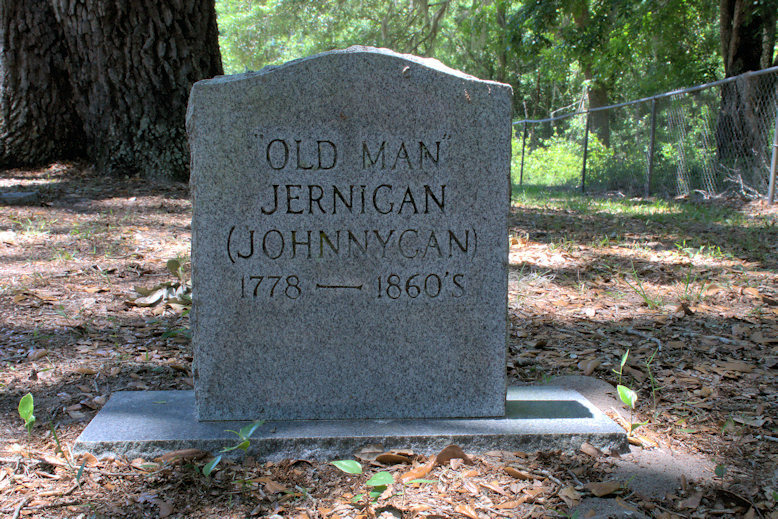 Also buried with the Canadays is Old Man Jernigan (Johnnygan). I’m unsure at this time as to his connection. 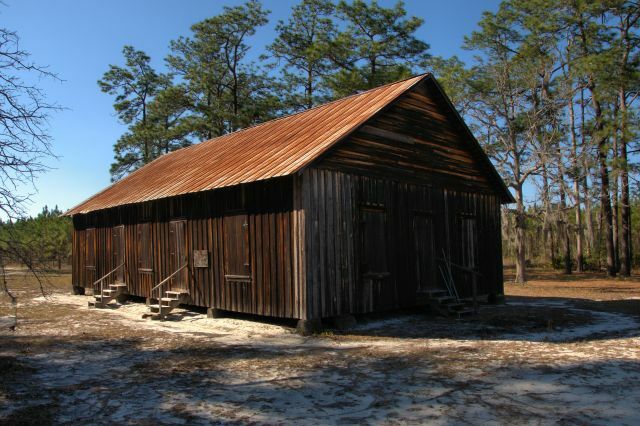 Joe Hopkins writes that this the was commissary for the turpentine operations at Toledo. 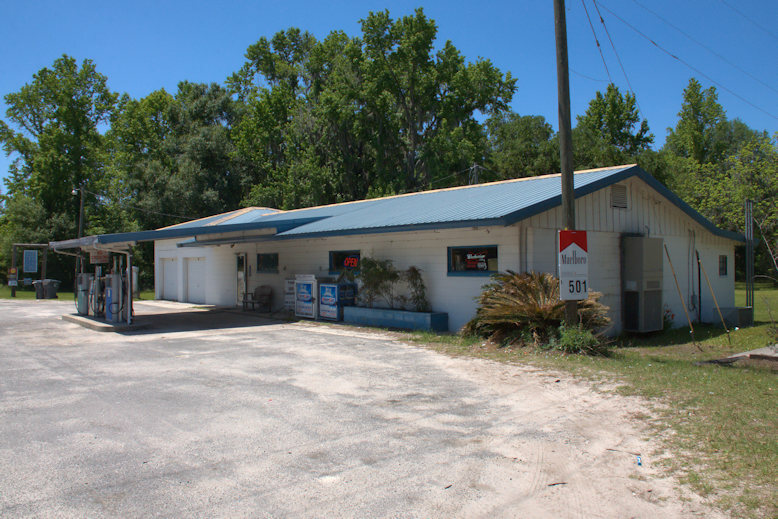 I would go there on Saturday mornings when I was a kid with my great uncle to pay off the turpentine employees. 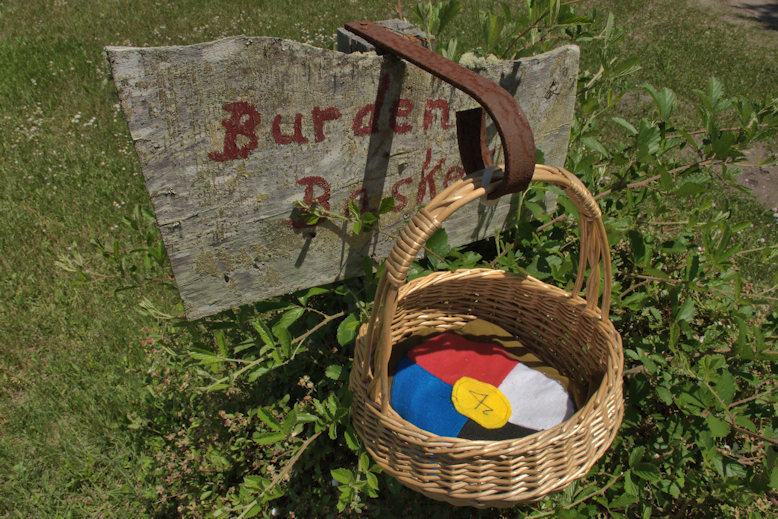 The store housed basic staples and dry goods for the workers living at the Toledo settlement and the business records of the company. 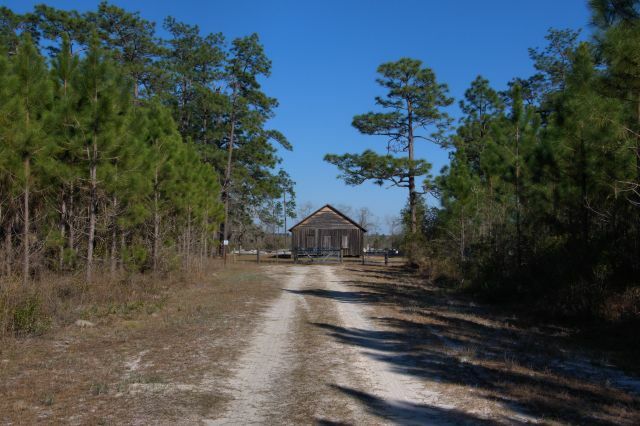 The dirt road on the porch side of the commissary was the original road running from Folkston to St.George. Though some sources give dates for the Alabaha/Crawfordite churches, there is really no way to determine this as they do not keep the type records which would validate these dates. 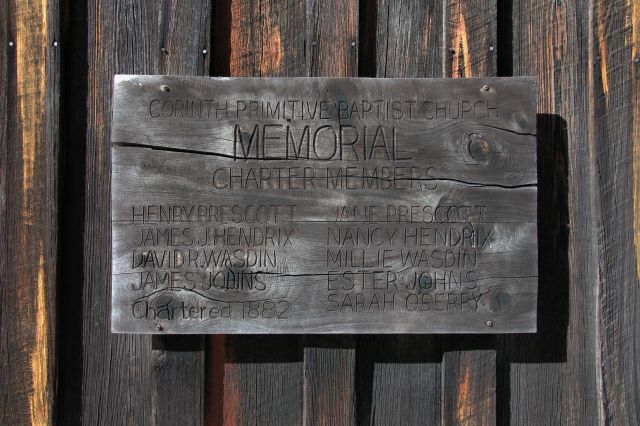 Since this congregation dates to 1882, it is assumed that the church was constructed around that time. 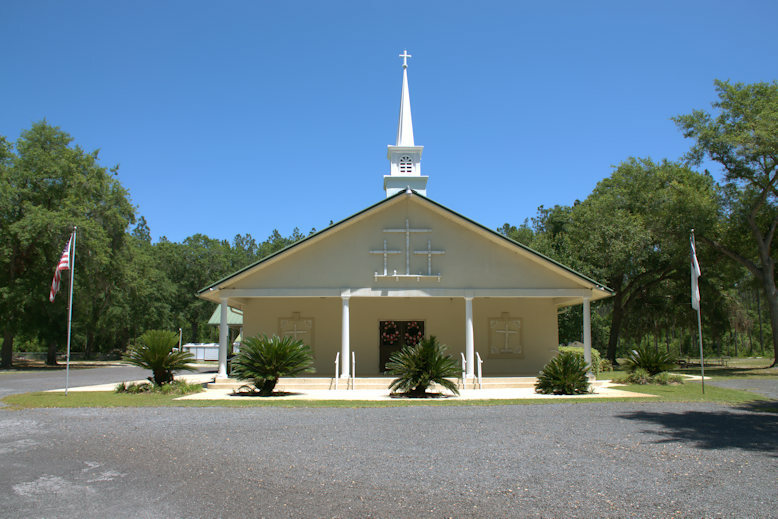 The interior is plain as are those of all the Alabaha/Crawfordite churches. 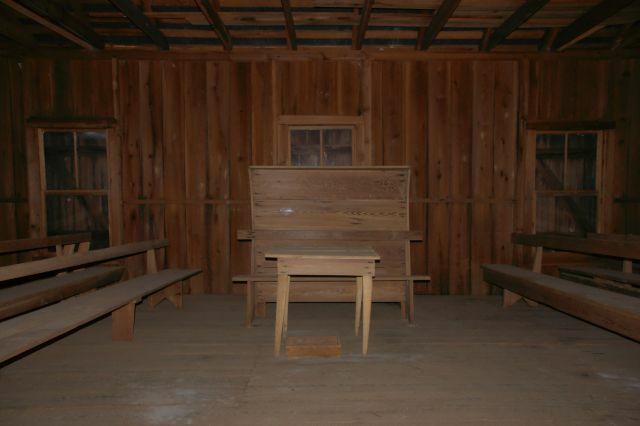 Since this one has glass windows under the wooden shutters, I presume it is still an active congregation. 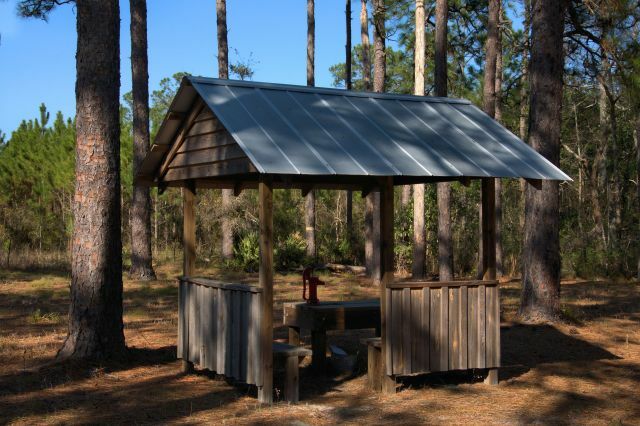 There’s a privy on the grounds, as is emblematic of these churchyards, but there’s also a nice pump house. 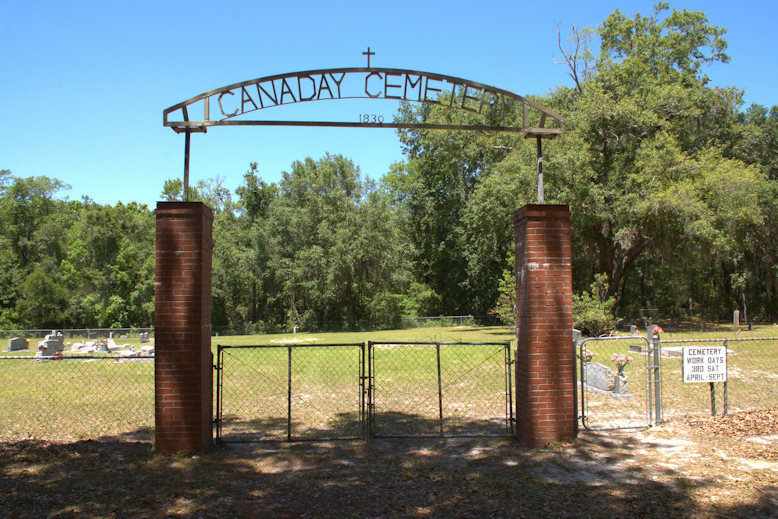 The meeting house and a rather large historic cemetery can be found at the end of a dirt driveway. This is the view when you’re leaving or arriving.